Former IAM Southern Territory Grand Lodge Representative Steve E. Williams, right, passed away recently at the age of 97. 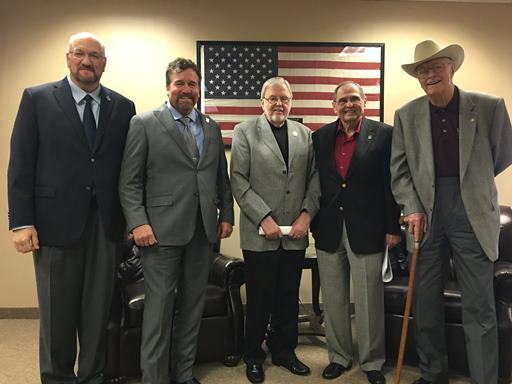 From left: Southern Territory Chief of Staff Jeff Smith, Southern Territory General Vice President Mark Blondin, retired Southern Territory General Vice President Ed House, retired Administrative Assistant to the International President Dean Girardot, and Williams. Steve E. Williams, a 71-year IAM member who served as a Grand Lodge Representative in the IAM’s Southern Territory for 30 years, passed away on Monday, February 20. Williams, a lifetime member of the IAM, was 97 years old. Williams was the organizing director for the Southern Territory. The IAM loaned his services to the AFL-CIO, where Williams served as organizing director for the Industrial Union Department. “Steve was a great organizer and had a long, successful and colorful career,” said retired IAM Southern Territory General Vice President Ed House, who served with Williams. Before joining the IAM, Williams was a member of the U.S. Army Air Corps. He flew cargo missions in China, India and Burma over the Himalayan Mountains. Following his retirement in 1981, Williams was chairman of the board for the Gulf Coast Trade Center in New Waverly, TX, an organization that helps troubled and disadvantage youth learn a trade and obtain a high school diploma. He would go on to serve as a board member for the Community Learning Center in Fort Worth, TX, which provides employment services for veterans. The post IAM Mourns Death of Retired Grand Lodge Representative Steve Williams appeared first on IAMAW.